When I had my house built we wanted a deck off of the master bedroom and we even installed a door to access it. Well, all we had was a door to nowhere. Finally about 1 year later we finally got the funds ready to get it done. We estimated the costs and realized we were going to have to do some of the work ourselves, or wait until we had more funds. My husband decided to design the deck and my father and I volunteered to dig holes and frame the footers. We decided we would hire a contractor to erect the deck and build the railings. After the basic deck design was finished, which took a lot of measuring and remeasuring and quite a few pieces of graph paper, we had to choose a deck material. WOW, what a lot of research we had to do to decide. There happen to only be about three basic options to choose from, but within these three there are many subcategories. The three main choices we found are Pine, Redwood, and Composite. 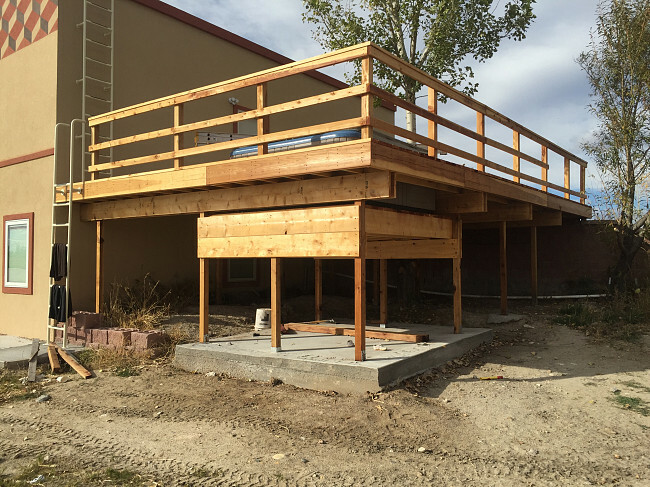 Even with a composite deck you still need a basic structure built out of wood so you have to choose pine or redwood for the framing of the deck. We decided on composite because it seemed to be the best choice for longevity. We went with untreated pine for the frame of the deck because it is cheaper than redwood. We decided against treated pine for two reasons. The first being that the chemicals they use to treat the pine aren't really human friendly. 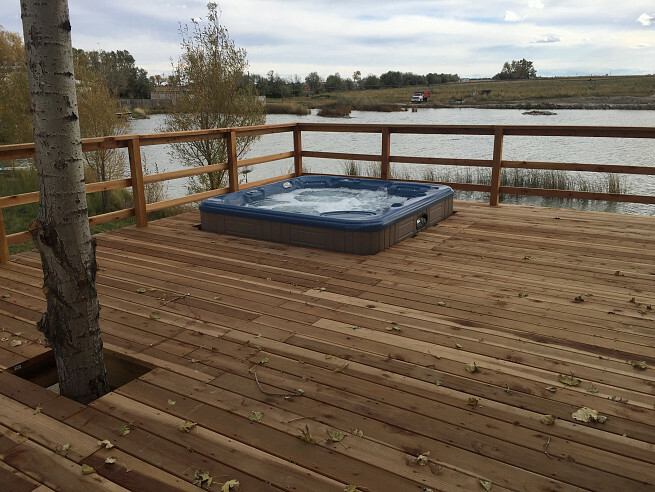 The second reason being that in the dry climate we are in (Wyoming) the treated pine has a tendency to warp over time and cause all kinds of problems in decking. We found a contractor using google and we also saw him on Facebook as part of a local classifieds group. We ended up getting bids from three contractors for labor only as we wanted to order the materials ourselves. The first contractor wanted to give us an hourly rate with a maximum number of hours to complete the project with the total cost not to exceed $2500. The second contractor said $3000 for the project. The 3rd contractor did a Cost plus estimate and came in at $6,000 for the labor. Wow, what a difference in the prices! We decided to go with the second contractor because our children played on the same t-ball team. I know, I know, perhaps not the best reason to choose a contractor. And yes, maybe, just maybe we should have called a few references first. But uh-oh, he said not to buy the composite decking, he said he wouldn't even install it because it will fall apart in 10 years. So we decided on plain ole' pine for the deck and rails. We shopped around for price, and finally settled on having it delivered from a big box hardware store about 70 miles away. The local guys wanted nearly double what the big box wanted and there was only a $100 delivery fee. After the materials showed up we thought woo-hoo, but unfortunately the $3,000 contractor couldn't start the job until he finished the one he was currently on. It was about three weeks later, and he was finally able to get started. He wanted $1500 up front to start the job. Uh-oh, I thought, I've heard of these scams before, so I made sure to get a receipt stating exactly what the money was for including a statement that the $1,500 up front included a full completion of the deck. Upon completion I would owe another $1,500. Any other type of contract would have been difficult for me to write up with provisions for partial completion etc. It is important to make sure you have enough information about a contractor to file claims suit in your area if work is not completed properly and a deposit was given. If we would have hired the $6000 contractor he would not have required any money upfront, so this was the price I was paying for hiring the cheaper guy. I just made sure to have my bases covered in case of him defaulting. If you are putting up money up front, please make sure you have enough information about the contractor in case you need to file in court. It's not likely that you will have any problems, but better safe than sorry, right? After Chad commenced working on the deck he immediately ran into a problem with our design because my husband hadn't taken into account the electrical box mounted to the wall. We designed a workaround, but it surely wasn't to code. Fortunately we live in a county where we don't even need inspections for building out of the city. The solution wouldn't have been too painful, just have to put in another footer, but would have slowed down work a couple of days. The deck builder was on the job for about three weeks, coming about every other day. I assume he was working on another job in parallel with ours. My only complaint was that on my day off work he was up and at it early and of course this deck was being built right outside my bedroom door. Ah well, I guess we all have to give a little to get a little. In the course of erecting the deck it turned out we were short a few materials so I had to have my husband pick some up from the local lumber yard a few times. All in all Chad was a great contractor to work with, did a wonderful job, and left with both he and us happy. 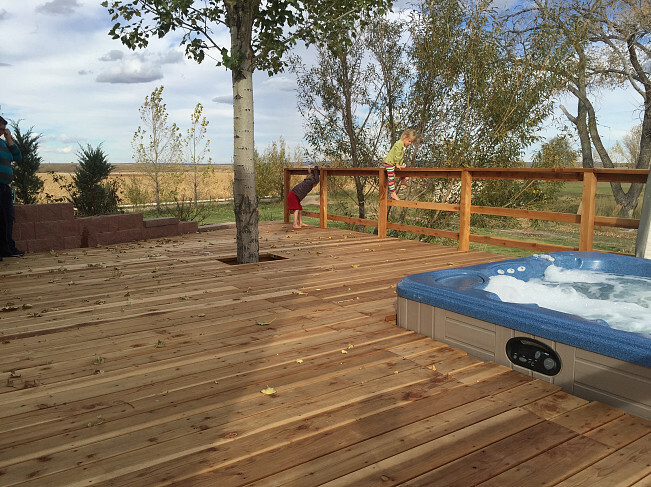 In the end we got a beautiful deck that the whole family is happy with, especially mama because she now has a hot tub right out the door from her bedroom. New Stairs And Roof Installation Are The Perfect Deck Upgrade by Judy S.
A Professional, Punctual Back Door Replacement by Mark L.
All Our New Home’s Electrical Work Done by One Skilled Contractor by Linda N.